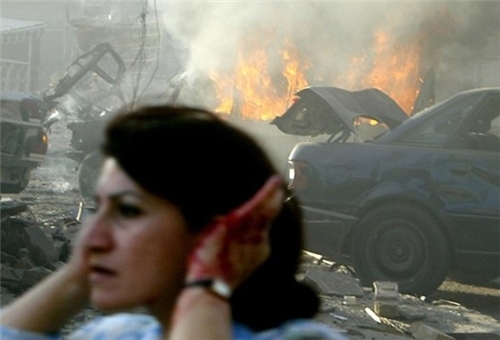 TEHRAN (FNA)- At least 20 people were killed in bomb attacks in Christian areas of Baghdad on Wednesday, including a car bomb that exploded near a church after a Christmas service, police and medics said. A bomb in a parked car went off while worshippers were leaving a church in the Doura district of Southern Baghdad after finishing prayers, police sources said. Most of the victims were Christian, they said, Reuters reported. Violence in Iraq has risen to its worst levels in more than five years as hardline Sunni militants linked to Al-Qaeda step up attacks on the government of Prime Minister Nuri al-Maliki and anyone seen as supporting it. Many thousands have been killed in attacks this year. The minority Christian community has been a target of attacks by Al-Qaeda militants in the past, including a 2010 attack on a church that killed dozens of people. Two bombs also went off in a crowded market in a separate, mostly Christian area in Doura, killing another six people and wounding 14, police and medics said. A series of car bombs, shootings and suicide attacks killed scores of Shiite Muslim pilgrims in the week before the Shiite holy day of Arbaeen, which coincided with Christmas Eve this year.